This is (the last) part of my series about symmetry in origami. A tessellation is a set of tiles that fill up a 2D plane. And I do mean the entire 2D plane, infinite in extent. When we talk about origami tessellations, these are models that could hypothetically fill a 2D plane, if we had an infinite amount of paper. 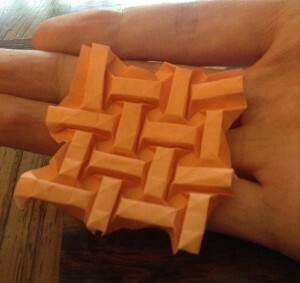 In practice, an origami tessellation is finite, but for the purposes of discussing symmetry, we will imagine them to be infinite. Previously, I only discussed two kinds of symmetry transformations: rotation, and reflection. However, many tessellations have repeating patterns, and this in itself is another form of symmetry. Are there other kinds of symmetries that we forgot? Let’s take an inventory of all the possible kinds of symmetry transformations. This is our session at OrbitCon. At time of writing, OrbitCon is still live, and you can find all the videos here.